From afar you can spot the domes reflecting the rays of the afternoon sun. But in a country known for the splendours of its ancient buildings, this sight is something rather more contemporary: roof-integrated photovoltaic panels that convert the sunlight into electricity, supplying Rabi Rashmi Abasan, India’s first solar residential complex, with a good part of its power needs. The 25 villas in the city of Kolkata, in India’s West Bengal, integrate solar energy, energy-efficient building materials and solar passive architecture. According to Santipada Gonchaudhuri, the man who conceived them, the villas can collectively reduce carbon emission by up to 55,000 kg per year. But the complexities of electricity pricing, and West Bengal’s continued heavy reliance on coal-based electricity production, have so far stymied hopes that this complex could inspire a revolution in renewable-energy living in India. Gonchaudhuri, one of West Bengal’s most high-profile advocates of renewable energy, is chairman of Ashden India, a renewable energy organization, and advises the government of the northeastern state of Tripura on renewable energy. He was inspired to build the complex by a television documentary about European eco-housing. Gonchaudhuri persuaded the government’s West Bengal Renewable Energy Development Agency (WBREDA), where he worked, to provide 0.75 hectares (1.85 acres) of land to develop an eco-housing project in New Town. The area, in suburban Kolkata, has burgeoning information technology businesses as well as the most home and office construction activity in the state. Rabi Rashmi Abasan means “solar-ray based dwelling” in Bengali, and each 155 square metre (about 1,700 square feet) villa generates 2.1 kilowatt hours of electricity from the photovoltaic panels that are fixed on its rooftop and integrated into the windowpanes – enough to meet 40 percent of standard household power needs. The buildings have been designed to reduce energy consumption by harnessing nature. Each villa has a south-facing lily pool that cools the air, which then enters a louvered duct to circulate inside, pushing warm air up and out through a chimney. This solar chimney effect reduces room temperatures by 4 degrees Centigrade, according to Gonchaudhuri. Summers temperatures in West Bengal regularly go above 40 degrees Centigrade. “Incorporating such passive architecture features, excluding BIPV (building-integrated photovoltaic technology), adds 7-8 percent to the total construction cost, recoverable in six years from saved energy bills,” says Himadri Guha, a former professor of civil engineering who now develops real estate in Kolkata. According to Guha, this works out cheaper over the long term than installing and running air-conditioning in the houses. 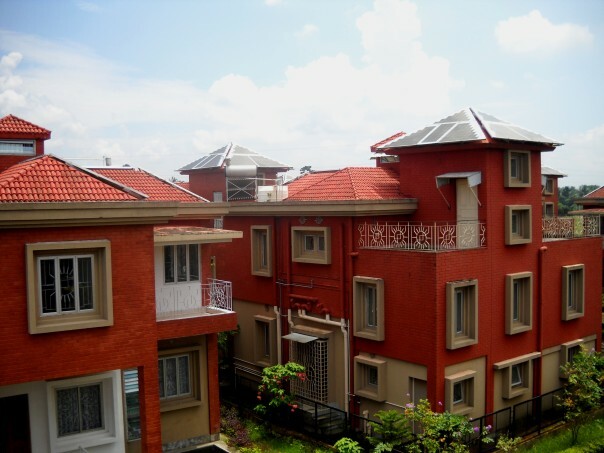 The feature of the villas that makes Gonchaudhuri most proud is its “net metering” system. Unused energy generated by the solar panels is directed into the conventional power grid, to which the villas are also connected. When this happens, the house’s electricity meter runs backwards, recording an energy credit that can be used later by the individual villa owner. Gonchaudhuri points out that Rabi Rashmi Abasan was the first real estate development to use a net-metering system, and that has “successfully pushed solar expansion in the state,” he says. While no other residential complex in the state has adopted the net metering system, the West Bengal governor’s residence and some 100 private, missionary and residential schools are fitted with solar systems and some use of net metering, according to Sushobhan Bhattacharya, director-in-charge of the West Bengal Renewable Energy Development Agency. But the Rabi Rashmi complex has had greater difficulty enticing imitators in the residential sector. Although intended as a national showcase for economically and environmentally attractive housing, it has inspired only two other such solar housing models in the rest of India, in Pune and Chennai. Meanwhile, environmentally unfriendly high-rise apartments continue to mushroom in its own neighbourhood. “It is the coal (business) lobby that is posing the biggest obstruction to green energy take-off in West Bengal,” Gonchaudhuri says. Ninety-seven percent of West Bengal’s power generation is coal-based, according to environmental activist Subhas Dutta, compared to 54 percent for India as a whole. Some observers maintain that the political will to promote renewable energy waned after a new state government was elected in 2011. Solar power usually sells at a higher rate than conventionally produced electricity. Even though the price has fallen to 7 rupees ($0.11), it is still 40 percent higher than West Bengal’s lowest subsidized tariff band. But residents of Rabi Rashmi can only exchange their renewable electricity at the same rate as for conventional power, effectively losing the solar premium. According to government figures, West Bengal’s installed capacity of grid-interactive solar power – the kind used in Rabi Rashmi – increased from 1.15 megawatts (MW) in 2011 to 2.05 MW in 2012. By comparison, the state of Gujarat increased its capacity from 5 MW in 2011 to 605 MW in 2012 over the same period. On a recent weekend visit, Rabi Rashmi appeared deserted. More than half of the homes were locked up, their owners reportedly not living there. A senior official of the WBREDA, which partnered in building the complex, and who requested not to be named, said that the non-resident Indians and affluent local businesspeople who bought the villas visited on weekends or during holiday seasons. Despite these challenges, the villas’ resale price has risen to 10 million rupees ($156,000). In 2008, when they were completed, they were each priced at 4.5 million rupees, including a 10 percent state subsidy for the solar technology. Gonchaudhuri believes that solar-powered apartments will become more attractive in two or three years’ time, when coal prices, already rising as the government withdraws subsidies, drive up domestic electricity tariffs to 10-12 rupees per unit, about double their current average. Even though annual average domestic consumption of electricity in urban areas of India is less than 5 percent of that in urban parts of the European Union, the country is struggling to keep up with demand. The government says that conventional power capacity grew by 14 percent from 2011 to 2012, but India still faces an energy deficit of 8.7 percent. Gonchaudhuri maintains that the competitiveness of solar power, combined with the falling cost of solar panels, will help developers and owners recover the capital costs for solar installation capital more quickly. In June this year, the Kolkata High Court, responding to public interest litigation by Dutta, ordered municipal bodies to ensure that all new high-rise buildings install rooftop solar panels by mid-October 2013. West Bengal’s two largest urban municipalities – Kolkata and Howrah – have ruled that construction permission will be withheld unless large buildings and apartment blocks ensure that green energy constitutes 1.5 percent of total consumption. Gonchaudhuri wants to see that proportion increased. “The future lies in independent solar plants with micro-grids in residential clusters to address the peak-time shortages and low voltage in the city,” Guha said. The conventional grid supply could augment low-voltage hours and monsoon months, he added.